The Rockets gain first possession of the ball from the tip off. 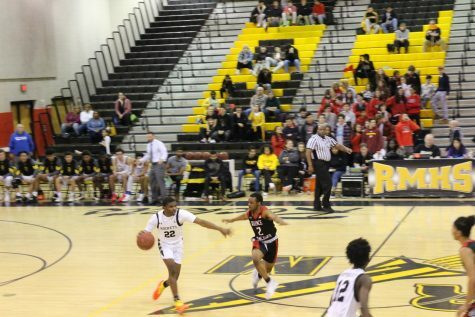 On Friday, Jan. 18, the Richard Montgomery boys basketball team fought an intense battle against the Quince Orchard Cougars. After a slow start, the Rockets were able to keep their winning streak alive and improve their record to 10-0. RM started off strong, gaining possession of the ball from the tip off. However, neither team scored for the game’s first three minutes. The first points of the game went to Quince Orchard from two foul shots made by their senior center Miles Gally, putting the score at 2-0 at five minutes and 53 seconds into the quarter. The Rockets offense maneuvers past the Cougar’s defense. Photo by Megan Harrington. By the second quarter, the Rockets got into their groove with points scored by Brian Sadeghi, Kordell Lewis, Devin Liyanamana, Miles Gally and Djordje Orcev. By the time halftime rolled around, the Rockets were ahead 22-15. Heading into the third quarter, Quince Orchard was ready to fight back. They scored multiple foul shots that tied the game up at 27-27. The ball went back and forth between the Rockets and Cougars until two more baskets by each team put the score at 29-29. Towards the end of the third quarter, Rockets sophomore Ryan Cornish made an impressive steal from the Cougars which unfortunately ended up becoming a missed shot. In the last few seconds of the quarter, it seemed as if the quarter would end in a tie. 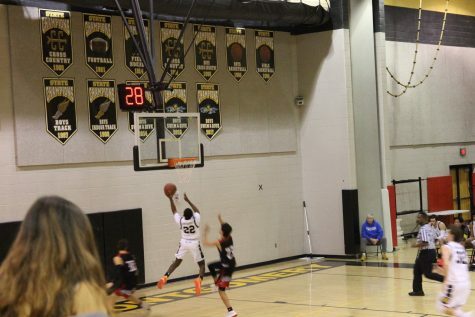 However, a last minute three pointer by Quince Orchard put the Cougars in the lead at 32-29. Entering the fourth quarter, the Rockets were ready to come back stronger and were determined to not let their nine game winning streak end. The score was going back and forth with fouls conducted by both teams. Two minutes into the fourth quarter, Liyanamana scored a three pointer which put the score at 36-35. Making two out of the three foul shots, Orcev pulled the Rockets ahead by one. The Rockets score a basket against the Quince Orchard Cougars. Photo by Megan Harrington. Toward the end of the game, the crowd was cheering on the Rockets, hoping for another win. With only a few seconds left in the game and the Cougars up by one, Cornish ran down the court with the ball. With no teammates open, he shot for a three and sunk it. This allowed the Rockets to pull through with a win 44-42. The Washington Post ranked the Rockets tenth in their article “Boys’ basketball Top 20″, which means the boys have a high chance of heading to the playoffs. The Rockets look forward to keeping their winning streak alive when playing Wootton on Tuesday, Jan. 22. Megan, great article and photos.